Very nice one bedroom apartment with balcony located at the back of the building. It is very bright and sunny and located in the heart of Recoleta in a very elegant and secure building. It is only 2 minutes from the church of Pilar and the best restaurants, cafes, and bars of Recoleta. 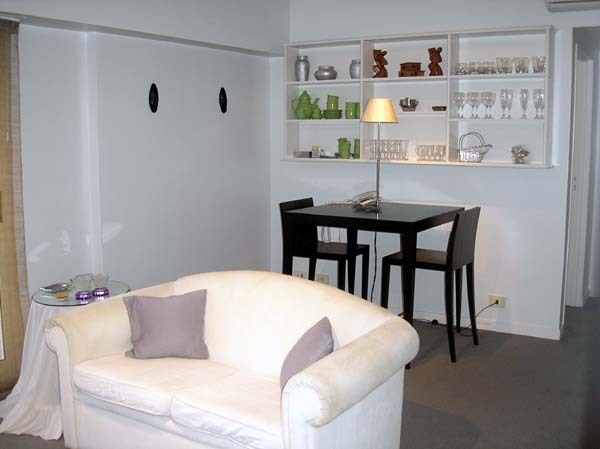 The living room has a two confortable sofa, it has a dinning area with table and chairs. The bedroom has a double bed and air conditioning. The kitchen is fully equipped. The bathroom is complete with bathtub and shower. Balcony to the back of the building. 24 hs security ( doorman). Bright and quiet with an excelent view. Carpeted floor, two aircons, cable TV, Video. The kitchen is equipped with microwave, fridge, freezer, coffee maker, toaster and a gas oven, washing machine. It has all kitchen utensils and towels and bedding are suplied. Excellent building . 24hs doorman . City centre, bus stop, Recoleta Village, cinemas, church, university, gym, solarium, restaurants, pub/bars, nightlife area, exclusive commercial area, square, cinema, museum, art gallery, cultural centre, historical place, market, convention centre, laundry and parking space. Included: Electricity, gas, water, buiding and city taxes, telephone, internet high speed.